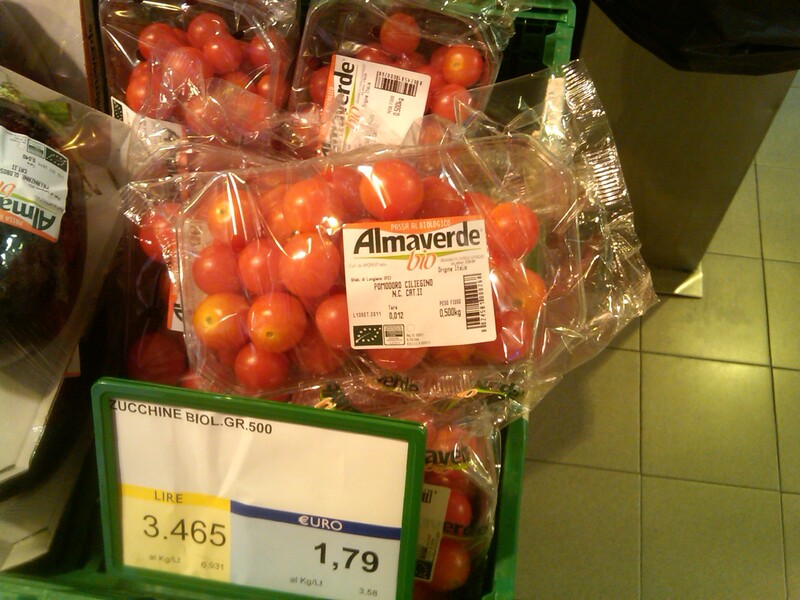 To get started – there are three types of grocery stores in Italy. First there is the alimentari, which is the equivalent of a neighborhood grocery store, usually very small. It is common to find a small assortment of items here, but generally you find everything you need: bread, vegetables, wine, bottled water, pasta, meats, and dried goods. Next is the coop, or small grocery store, usually found at the edge of the main part of the city, just outside the walls of the old city in many places. Names you may recognize are found throughout Italy – Conad, EMI, Eurospin are the ones near where I am this week. These are a bigger version of the alimentari, which means more variety, but these also commonly carry other items such as cheap clothes, cooking utensils, seasonal items, and lots of weird items you would not expect to find in a grocery store. Conad has some stores that stay open 24 hours now. The third type is the hypermarket – a very large grocery store with lots of variety and many items that don’t belong in a grocery store, such as cheap power tools. Many carry electronics either in the store or in separate stores – a sort of mini-mall. These are usually found in the industrial area, often just off the highway. 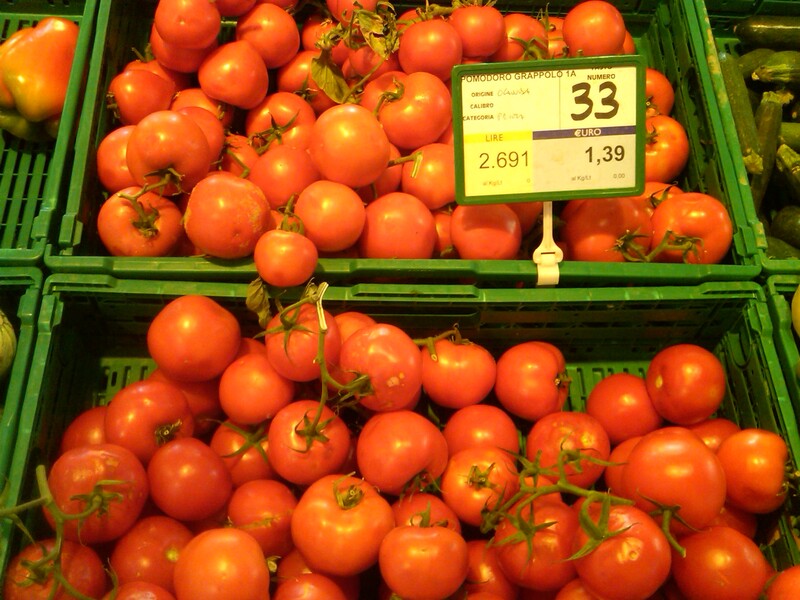 Vegetables are found in all three types, and here are some photos of four types of tomatoes, just to give you a sense of what you can buy. 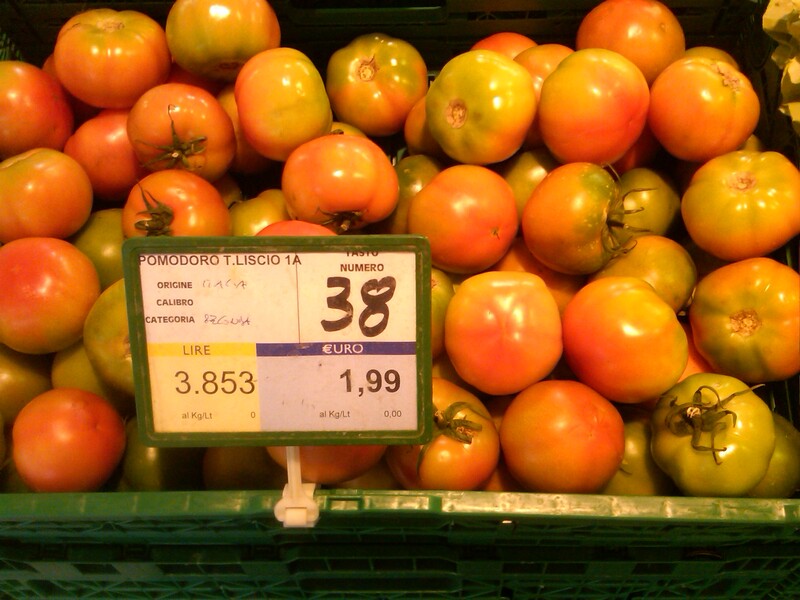 The oblong type is what we would call Roma tomatoes. 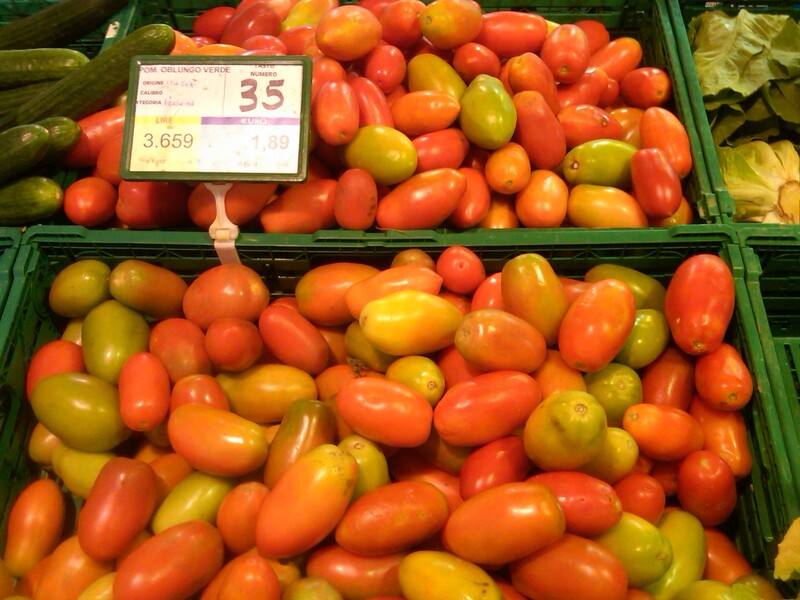 The grape tomatoes are pretty big – not what I would call grape tomatoes, but the distinguishing feature is that they are clustered on the vine, rather than loose. The cherry tomatoes are packed since they are so small. Don’t forget to weigh the produce before you take it to the checkout! Of course we checked the olive oil selections. We are always on the lookout for new olive oils for Olio2go. The neighborhood shops will have the high end stuff. The big box stores tend to have a wide assortment of good and not so good oil, but not so many very very good oils. Salumerias also have high end oils as do cheese shops in the tourist areas. Wine shops carry the high end oils, too. One of my favorite wine stores is in Verona, and they carry a number of very good oils. 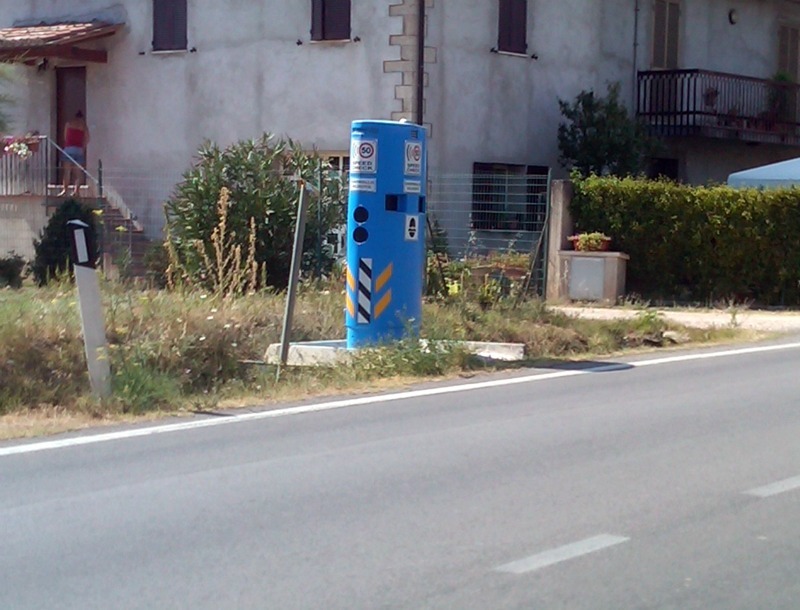 The Marfuga– I first saw in a small alimentari in Spoleto. In some cases the town has an enoteca that has wine and oil. For example, the enoteca in Rome near the Spanish Steps that sells Merlano (which we plan to again carry with the 2011 harvest). As in Washington, DC, if you don’t bring your own bag (a borsa) then you have to buy one or else put the groceries in your pockets (to request a bag, say to the checkout person “ho bisogno una borsa” before he or she slides your items to the end of the checkout lane). The bags are not expensive – a few euro cents, but after a couple of trips, you learn to bring them with you. At home, I keep my borsa in the compartment of my Vespa for just such a reason. If you want a grocery cart, be sure to bring a euro or a 50 cent piece, because the carts are all connected together with a chain. You just stick the coin in the slot and the lock opens to let you take the cart. This works much better than in the US because all the carts are always neatly arranged. You would be frivolous to let your cart roll off toward the cart area because you’d lose your coin. The Italian method pretty much guarantees that all the carts stay where they should. Bread in Tuscany and Umbria is usually unsalted, to protest the salt tax imposed by the Pope 500 years ago, or something like that. Hence the bread can best be described as “insipido”, and it also goes stale very quickly. So you will need to go shopping every day or get by with eating unsalted, soon-to- be-stale bread. Or you could go out to eat. And like everything else in Italy, many of the stores close from noon until 4:oo pm. The bigger coops and hypermarkets do not close, but sometimes the deli counters are not open during those hours. It is just part of the culture and rhythm of life in Italy. A Month in Medieval Volpaia Tuscany is a charming brief memoir. Robert and Patricia Crosby capture their full weeks in September and October. These are the slower days of late summer and early fall, after the tourists have left. Robert and Patricia provide a series of diary entries of their day to day visits to trattorias, town squares, and churches. Each day is a peaceful adventure, full of love for their friends and experiences. Take a walk with the authors through their day to day experiences, along with visits to our favorite places, the olive oil estates of Volpaia and Badia a Coltibuono. Another favorite stop is a visit to Panzano, the home of Dario Cecchini, the Dante-quoting master butcher of Chianti. (We’ve written about him before). A Month in Medieval Volpaia is a quick read, and a perfect gift with a selection of Badia a Coltibuono, Albereto, Campo Corto, or Volpaia. We found this book to be well produced, and charming, but occasionally repetitive. It is perfectly written for those of us who dream of having such a month to spend in the Chianti Classico. Pamela Marasco demonstrates her love for all of her acquired Italian heritage in her self- published family treasury, Seeing and Savoring Italy. This will be read by her family and others for generations. She married into an Italian American family and grew close to her husband’s grandmother. Through the years this granddaughter-in-law sought to capture and recreate memories and heritage through food customs. 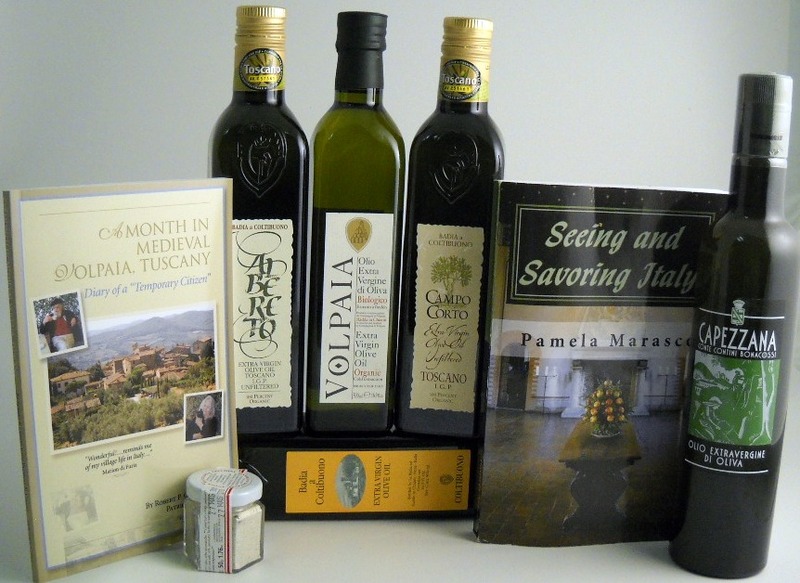 From olive oil, to cheese, to wine, to chocolate, Pamela is to be commended for trying to get it all into one book. Recipes are interwoven through the chapters as she visits Tenuta di Capezzana, Avignonesi, and other places dear to us at Olio2go. Bistecca alla Fiorentina, Olives all’ascolano, and risotto, fill the pages between Sagra (festivals), wine, mostarde, and tartufi (truffles). Well-researched and endearingly written, future editions will be improved with one more pass through an editor and graphic designer. If you can find a copy of The Tuscan Year, now out of print, you’ll enjoy a very pleasant and well written year in Tuscany. It fits nicely with A Month in Medieval Volpaia and Seeing and Savoring Italy. You can see The Tuscan Year and Seeing and Savoring Italy on Our Favorite Books That We Don’t Carry on Amazon. Even in Todi, Italy, there is a 9-11 Memorial. 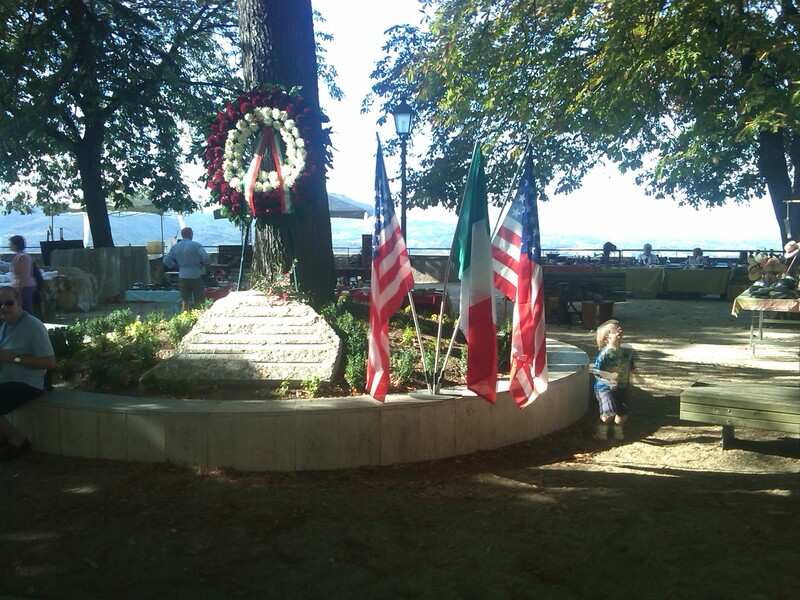 Jeff was traveling in Italy on 9-11 and sent this photo of the memorial in Todi. It is comforting to know that 9-11 is also in the memories of our friends around the world. Photo taken on the 10 year anniversary.